I asked myself... are vegan cupcakes tasty without any eggs, milk and any dairy products? Mummy, this cupcake tastes like Reese! - It is true! Eating these peanut butter chocolate heaven vegan cupcakes are like eating Reese's Peanut Butter Cups Chocolate but interestingly, in the form of chocolate cupcakes with peanut butter frosting. Being a vegetarian-wannabe-me, I'm happy that these peanut butter chocolate cupcakes with no use of any animal products are actually tasty to eat! I'm happy too that both my never-becoming vegan husband and son were enjoying these animal-friendly cupcakes too. However, I must admit that the taste and texture of these cupcakes are never the same as those with butter, milk, cream and eggs. These chocolate cupcake bases are very moist and chocolat-y but somehow I can detect a subtle soy milk taste in them. Without cream or butter, they are not very rich in their chocolate flavours and texture but nice being light and fluffy. 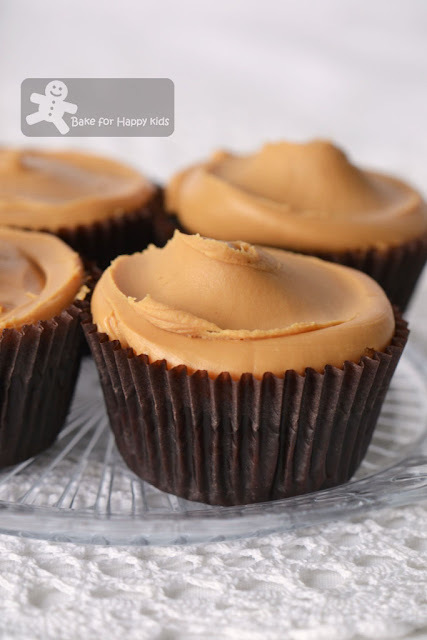 To make these cupcakes extra heavenly, this recipe suggest serving these chocolate cupcakes with chocolate ganache and peanut butter cream. Are chocolates vegan-friendly? Not all but only those being dairy-free... Being chocoholic, I'm fussy buying the chocolates that we eat and refuse to buy any dairy-free chocolate for all reasons. Thus, based on the chocolate ganache recipe in this book, I have made a modified version. Comparing the usual non-vegan chocolate ganache, this one is not the usual creamy and luxurious kind but I must admit it is good enough being vegan chocolate ganache. 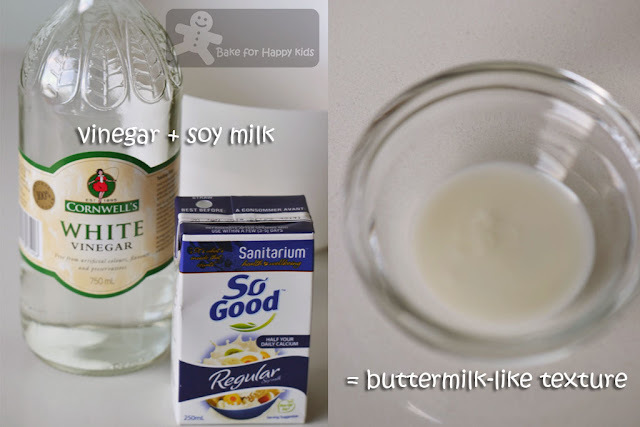 This is how soy milk becomes buttermilk! 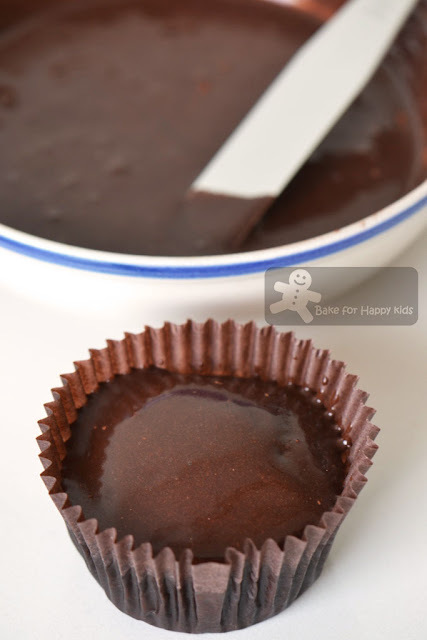 I didn't have dairy-free chocolate to make vegan chocolate ganache and so made this instead. Chocolate cupcake + chocolate-maple sauce = Near heaven... almost! I can't make any better vegan peanut butter frosting and this is all I have. Now... the final heavenly touch! 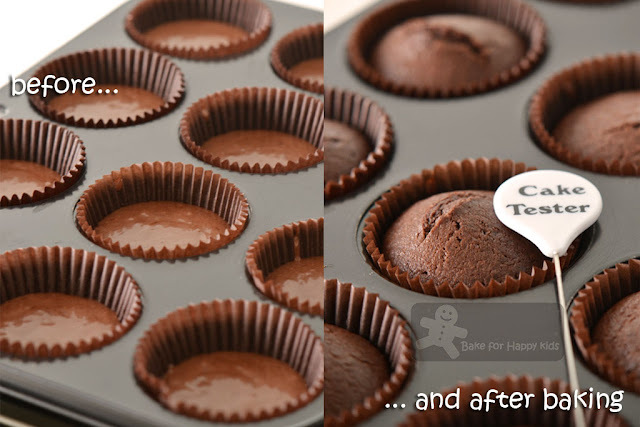 Preheat oven to 350°F (or 160°C fan forced) and line muffin pan with paper or foil liners. Whisk together the soy milk and vinegar in a large bowl, and set aside for a few minutes to curdle. Add the sugar, oil, and vanilla extract, and other extract, if using, to the soy milk mixture and beat till foamy. 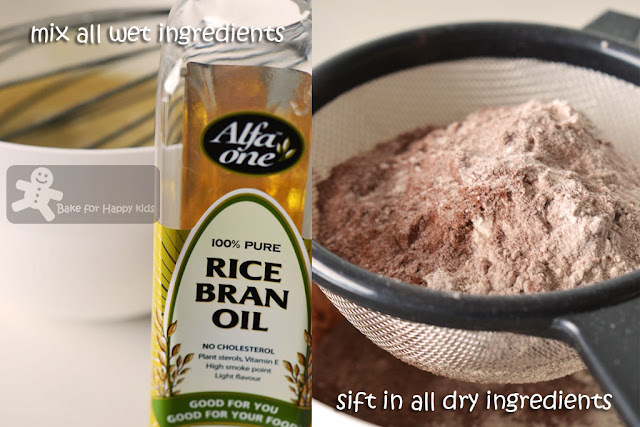 In a separate bowl, sift together the flour, cocoa powder, baking soda, baking powder, and salt. Add in two batches to wet ingredients and beat till no large lumps remain (a few tiny lumps are okay). Pour into liners, filling three-quarters of the way. Bake 18 to 20 mins (I baked mine for 20 mins), until a toothpick inserted into the center comes out clean. Transfer to cooling rack and let cool completely. Place 3 tbsp of cocoa powder in a bowl. 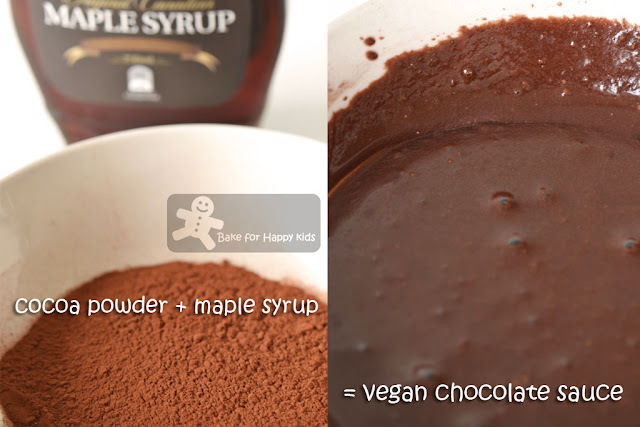 Add maple syrup gradually into the cocoa powder and stir as you add the syrup. Stop adding the syrup when the required smooth consistency is achieved which requires about 4-5 tbsp of syrup. This amount is enough to top 12 cupcakes. Fill piping bag with peanut buttercream frosting (or only peanut butter), and top the chocolate cupcakes with chocolate ganache topping. Pipe a swirl of frosting on top of glazed cupcakes (and shape frosting with a spatula if you are using just peanut butter). I like to sink my teeth into one of these.... Peanut butter and chocolate cupcakes are never easy to resist! Hi Zoe! I've made vegan chocolate cupcakes before and I must agree...they are so good! Yours look so rich and moist. Perfect! Thank you for sharing them! Glad I found your blog! I must admit, those Chocolate Vegan Cupcakes of yours sure look delicious! I often think that I may want to try and be more animal friendly also but I have such a difficult time adjusting to some of the ingredients required in lieu of those I am so use to. You, however, have done a great job of combining your likes and dislikes quite nicely while still remaining true to the recipe. Kudos to you! they look so moist and wonderful!! Your soy milk based cupcakes look moist and delicious! 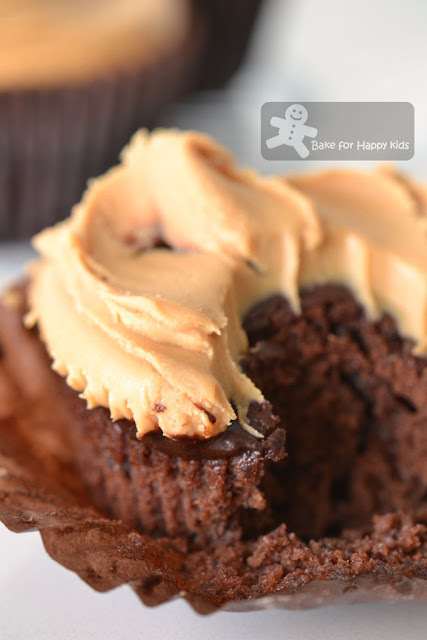 Those chocolate ganache and peanut butter frosting lift up your cupcakes to another level! chocolate + peanut, a good combination! We can't be vegan unless we don't bake anymore and stop eating eggs! I never thought of going totally vegan! I do love my veggies, a lot, but I can never go without meat! Maybe cut down on the intake, but not totally no meat at all! Haha! These cupcakes look amazing Zoe! Always love the combo of peanut butter and chocolate together:) You did a fantastic job keeping these vegan and they look so moist and delicious! Yum! This sound special. cant imagine the taste, but i think this is more healthy. Reeze can be too sweet at times, so it's nice to use it in our own baking so we can control the overall sweetness of our desserts. 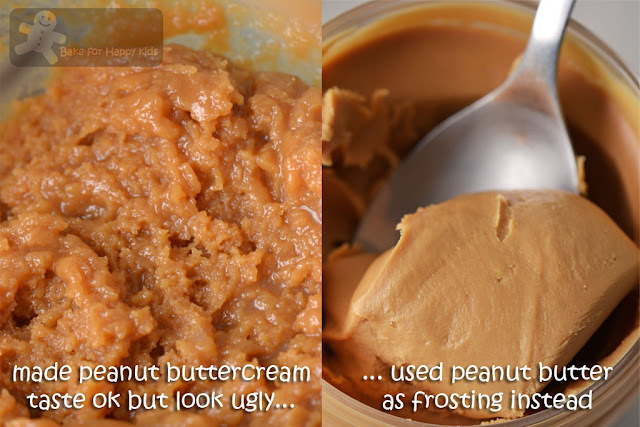 Love peanut butter! I know a bunch of people who are vegetarian, but cook meat for their non-vegetarian families. Oh these look absolutely yummy. I don't mind being a vegan with such tempting looking cupcakes. Being a vegan would be difficult (for the reasons you mention; I don't think I could live without butter or cheese), but I could easily be a vegetarian - so many of the dishes we make are vegetarian (and a lot are vegan) and it's totally by chance - we're not trying to avoid meat. Anyway, these cupcakes look like, well, heaven. ;-) Really good stuff - thanks so much. 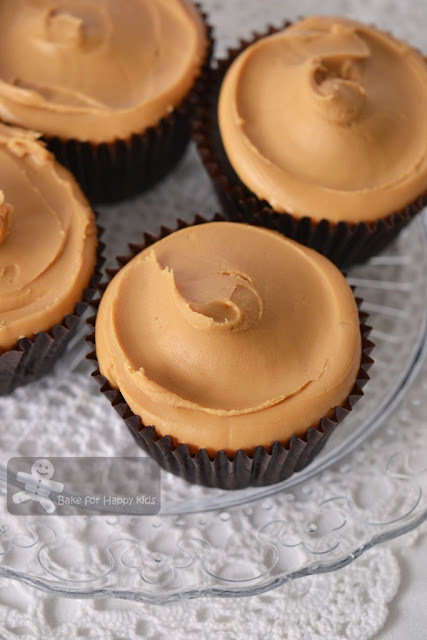 Cupcakes looks absolutely divine and peanut butter frosting is just breathtaking. I love chocolate and peanuts butter!